Ewan Macdonald farms extensively in The Black Isle, Inverness-shire and on the West coast of Scotland - as Cononbrae Farms with his brother. As well as both a large arable and a beef suckler cow enterprise, he has 2000 ewes – 900 Suffolk cross and Texel, Cheviot and Mule. “I am fantastically happy with Essie Suffolk cross ewes which consistently produce the top 10% of prime lambs in Scotland and top our local the market all the time. The scanning results of these ewes are 200% this year. At the end of the day, the cull price of the Suffolk cross ewe is £30 more than a Mule.” The Essie shearlings are selected on maternal traits (high Maternal EBVs) as well as sound mouths and feet and good conformation. 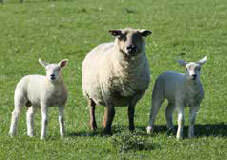 The lambing percentages from Essie rams are higher than any other breed. Ewan has bought Essie Suffolk rams for more than 15 years and has bought 3 or 4 every year.